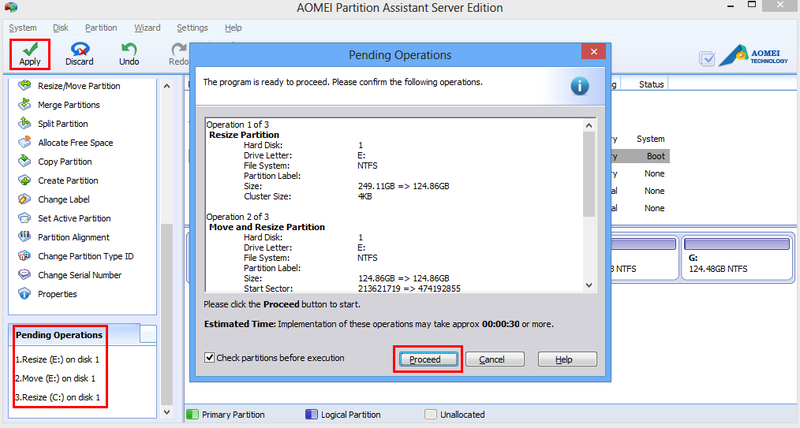 Since Windows Server 2012 built-in partition tool has some insufficiency, people have to seek help from partition magic server software - AOMEI Partition Assistant Server Edition to solve partition related problem of Windows Server 2012. Windows Server 2012 is the sixth release of Windows Server operating system. There are many highlights of it, such as an IP address management role, an updated version of Hyper-V, a new version of Windows Task Manager, and ReFS, etc. But here I don’t focus on these new features, I’ll talk about its common disk partition problems and how to solve them with partition magic server software on Windows Server 2012. With the service time of computer increasing, especially on server operating system, there will be more and more useless files, invalid files full of your partitions. The partition that contain system will be the first to be affected. And then the computer will slow down or even crash. So partition optimization is necessary. Basic operations such as how to resize partition? How to merge partition? Although Windows Server 2012 has many new features, its built-in partition tool has not add anything new. If you want to extend system(usually is partition C:) drive by shrinking D drive directly to get some free space, no way! Because the unallocated space must behind C partition, but most situations are not like this. However, moving partition will make data losing. Microsoft Windows is just a platform and it cannot do everything. Step1. Download from AOMEI office website, install and run, you’ll see the main screen. Step2. 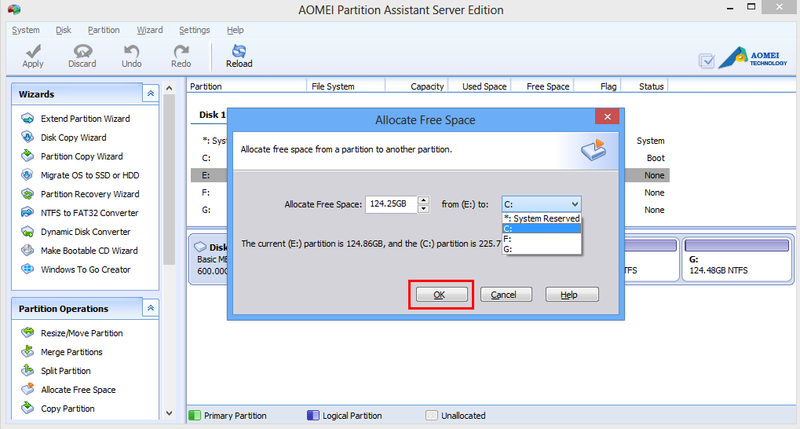 Right click E partition and select “Allocate Free Space”. In the pop-up window, input the value and select target partition to add free space to(here, I take C partition as an example). Click the “OK” button to back the main interface. Step3. You can see there are three pending operations on the left bottom. Click “Apply” button on top left toolbar to proceed partition resizing. If you are sure you want to resize partitions like this, “Proceed” on the pop-up window is the last click. 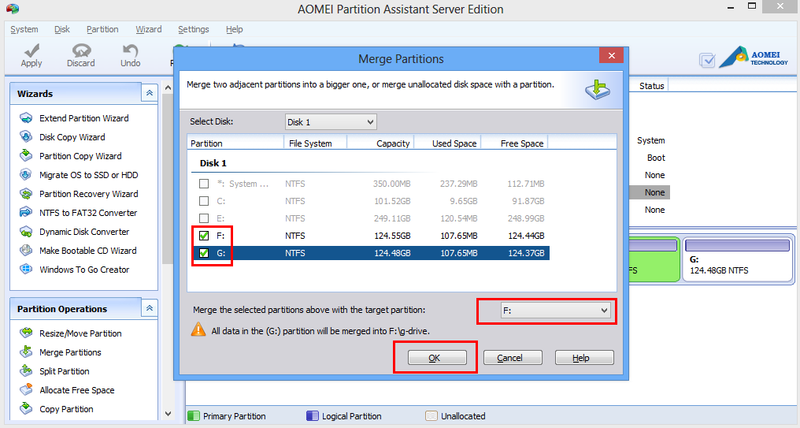 About merging partitions, it is also ease to do with AOMEI Partition Assistant. Select “Merge Partition” on the left toolbar to go to the next step. In the pop-up window, select two partitions you want to merge then click “OK”. Next few steps are similar as resizing operations, so I’ll ignore that here. AOMEI partition assistant integrates enhanced data protection technology which keep your operating system and data intact while optimizing partitions. Actually, this partition magic server software helps manage Windows Server 2012 in many aspects: create partition, delete partition, resize/move partition, split partition, align partition, format partition, etc. If you want to update SSD to HDD, you can select “Migrate OS to SSD” or “copy partition/disk wizard”. For more functions of AOMEI Partition Assistant, please click here. In conclusion, AOMEI Partition Assistant Server Edition not only supports the latest Windows Server 2012, but also previous versions: Windows Server 2008, Windows Server 2003; PC operating system versions: Windows 8/7/XP/Vista. 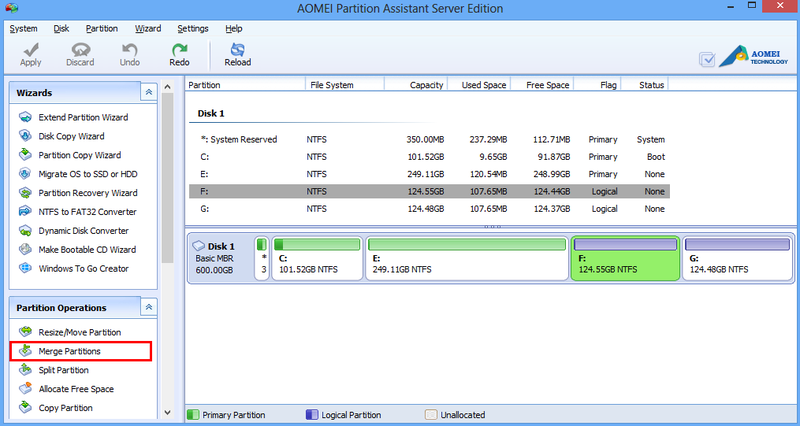 AOMEI Partition Assistant as a partition magic that can completely replace Windows disk management. So I strongly recommend you try this partition magic for Windows Server 2012.